After close to a half decade out of the ring, former WBA Welterweight, and (regular) Junior Welterweight Champion Marcos Maidana has announced that he’s returning to the fight game. The 35 year old Argentine brawler, who had accumulated a record of 35-5 after his last fight in 2014, hasn’t boxed professionally in well over four years. The announcement for his return was reportedly delivered to numerous Spanish language outlets and showed Maidana chilling out in a tub while letting the fight world know he was coming back. An exact opponent, location or date has not been set for his return. What is clear, however, is that Maidana has now signed a lucrative deal with Al Haymon’s Premiere Boxing Champion’s organization (PBC). According to Forbes, Maidana’s return fight will net him a million and a half dollars and may either occur in the junior middleweight or middleweight divisions. The idea is reportedly for Maidana, who let himself go in retirement, to get back into premium shape and then meet a major challenge later this year after an initial comeback bout. Maidana is said to have been inspired by Manny Pacquiao’s and Keith Thurman’s latest PBC matches. An exciting, rugged, sometimes dirty fighter, Maidana has previously faced a who’s who of big names. The last time Maidana was active in the sport, he faced pound for pound great Floyd Mayweather in two 2014 pay per view bouts. The first match, in the spring of that year, was a high octane, highly competitive affair. 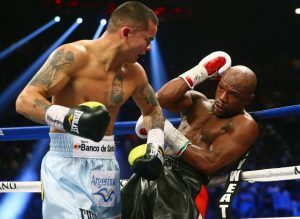 Mayweather was more dominant in the second go-round the following autumn, but Maidana clearly emerged as one of Mayweather’s toughest opponents. After losing both Mayweather fights by decision, Maidana gave the impression of being happily retired with his pay per view money. Like many retired fighters, however, Maidana has gotten the comeback bug. Aside from battling Mayweather, Maidana fought and bested Adrien Broner, then a rising star, in a thrilling 2013 affair, handing the Cincinnati native his first loss. Maidana also faced Amir Khan, who he lost to in a seesaw 2010 bout. Among the popular fighter’s best wins are matches against Victor Ortiz, DeMarcus Corley, Erik Morales, Jesus Soto Karass, and Josesito Lopez. Maidana is reportedly interested in rematching Broner, the loser of what was arguably his most famous bout. It’s unclear whether or not Maidana will reteam with Robert Garcia, the trainer he has enjoyed the most success with.